(Sept. 10, 2018) -- When the air horn blared signifying the five-minute mark before his wedding, Gary Alexander ’99 tried his best to hold back the tears in his eyes. 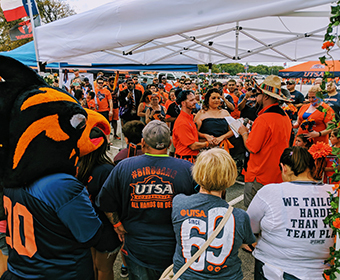 Fellow UTSA tailgaters began to swarm, cheering him on and awaiting the walk down the orange-and-blue-chalked aisle that resembled yard markers to where he would make his biggest touchdown – marrying Laura Chavez. The couple were married on Saturday, Sept. 8 at the Alamodome parking lot in a tailgate-themed wedding to showcase their love for one another and UTSA Roadrunners football. More than 200 tailgaters, including Rowdy, stood by and applauded the pair as they were wedded in matrimony. After Alexander proposed to his fiancée during a UTSA tailgate last season, the couple joked about the possibility of having their wedding take place at a tailgate. Laura’s father and current UTSA adjunct professor, John Chavez ’12, initially thought it was “the most insane idea” but he eventually changed his mind. For the bride, sporting UTSA cowboy boots, she had never experienced a football tailgate before meeting Alexander and was overwhelmed at the adoration the couple received from the crowd of wedding guests in the lot. 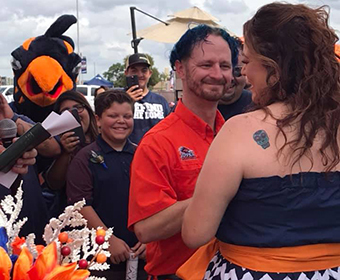 As the tailgaters lined up to congratulate the newlyweds, Alexander was taken aback by the camaraderie of the UTSA faithful who showed up for the first tailgate wedding at a UTSA football game. The couple was later feted on the Alamodome field during the game, appearing on Kiss Cam, and receiving a number 18 Roadrunners jersey with their last name on the back.